One of the most common illusions that can trouble newspaper readers is the notion that the front page is the serious venue for the most important news of the day. It is that, mostly. But not completely. It's also the face of a paper, hopefully an appealing face, and occasional a smile should be allowed, for variety's sake. Thus I was happy to see Don Featherstone's obituary on the front page of the New York Times Wednesday. Featherstone was, I learned, in Margalit Fox's whimsical send-off, the inventor of the pink plastic flamingo, which he designed when he was a 21-year-old employee of a lawn ornament company in 1957. Not the most earth-shattering accomplishment, true—to be honest, the fact on which his fame was based is not half as interesting, in my estimation, as the part of the obit that mentions that he and his wife wore matching outfits every day since the 1970s. Tell me more about that. There was something else that cried out for elaboration: "In 2009, after a debate of five minutes, the Common Council, as the city council of Madison, Wis., is known, voted 15 to 4 to designate the pink plastic flamingo the city's official bird." The obit hurried on—no shame there, you can't pull every thread—but I thought I'd share my special knowledge of exactly why that particular city might select that particular lawn ornament as its civic avian mascot. 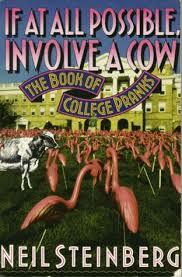 Here is the cover of my first book, a history of college pranks published in 1992. The photo is of Bascom Hall, on the University of Wisconsin at Madison campus, on the first day of class in 1979. What's going on here? In spring of 1978, a pair of costumed clowns, Jim Mallon and Leon Varjian, had run for the presidency and vice presidency of the Wisconsin student government as a kind of performance art. They called themselves the "Pail and Shovel Party" and, to their surprise and delight, won. The pair studded their first term with a variety of gags, including construction of an enormous replica of the Statue of Liberty's arm, from the wrist up, and head, from the bridge of the nose up, jutting out of the ice of frozen Lake Mendota, to fulfill a campaign promise to bring Lady Liberty to campus. In the fall, Pail & Shovel hit the ground rolling. The first day of classes, students were welcomed by over 1,000 pink plastic flamingos planted on Bascom Hil, the quadrangle in front of the dean's office. Students gaped in wonder. The birds may have been "blown north by Hurricane David, Varjian speculated. The flamingos were a wonderfully ephemeral prank. They had been set up at eight in the morning, and at first formed a uniform field of pink—people said it looked as if Pepto-Bismol had been poured over Bascom Hill. Almost immediately, however, the birds started disappearing. People would stop by, admire the hill, and grab themselves a flamingo. By 2 p.m., the entire flock was gone, though individual members were spotted around campus for years to come—in the windows of fraternities, on the roofs of dorms, everywhere. "It was a fitting end," Varjian said. You seldom hear about clever college pranks nowadays. Perhaps students are too focused on preparing for their musical chairs job hunt. Perhaps our focus on security makes any misbehavior too risky. Perhaps the pieties that good pranks pushed against are gone. But I couldn't let the passing of the originator of the pink plastic lawn flamingo go by without noting one of his creation's finest moments. Did you bury the lead? College pranks, pranks in general, are indeed a thing of our innocent past. Nowadays, America is much more mean spirited. Fraternity hazing has devolved into poisoned by drinking. Good natured fun has morphed into violence in a thousand ways. What we laugh at now speaks volumes about who we are. I remember how much fun this book was. 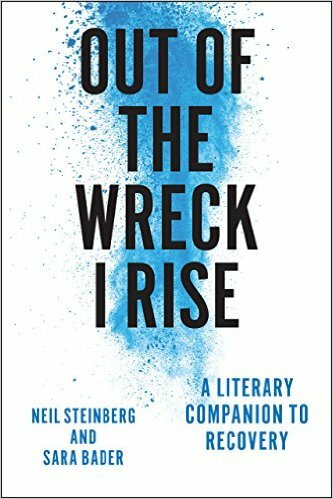 How long do we have to wait for your next book, on recovery? Legal complications pushed it back to fall, 2016, alas. That's terrible! I noticed the "2016" in your bio info at the Mosaic website, though that indicated "spring". I wondered what could possibly be taking even that long, as I thought you'd said that you finished it a while back. One can only imagine how infuriating it must be for you. Who could afford a thousand flamingos these days! There's a fundraiser where people pay to put a flock of flamingos in someone's yard and they have to pay to get it moved to another lawn. His wife made all of their outfits, started w just the tops then the bottoms as well. I'm amazed at that( sewing on a button and fixing a hem is the extent of my skills there). So true about millenials and what they have to go through for a job. I'm not getting the reference to Paul & Shovel in the first paragraph of the excerpt. Am I being dense? No, that was the name of the party they formed -- I clarified it. Sorry, and thanks.